Just as we need vitamins and minerals from our food to grow and thrive, plants need nutrients from the soil to grow. 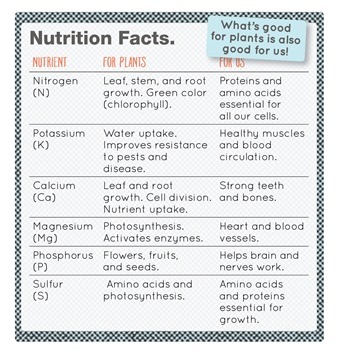 Phosphorus (P), nitrogen (N), potassium (K), and calcium (Ca) are important nutrients for plant growth. Soil passes nutrients on to us in the crops and the animals that become our food. As plant roots absorb water from the soil, they also take in nutrients that are dissolved in the water. 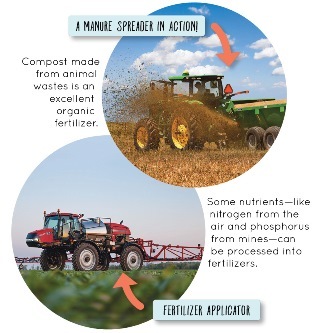 How do nutrients get into the soil? And farmers add nutrients to the soil. Most soils have a large supply of nutrients. But when soils are continually used for growing food, nutrients are removed when the crop is harvested. That’s why farmers must add nutrients to their soils. How do growers know how much nutrients need to be added to the soil? One way is using crop sensors. Crop sensors are computerized information-based technologies that are part of precision agriculture. For centuries, farmers have known that no two soils are the same. Some need more water. Some need more fertilizer. And parts of the same field can be different. And, if too little added, crops don’t produce as well while if too much is added, excess nutrients can run off the fields or leach down through the soil into the groundwater. However, with the help of technology, farmers can manage their fields as smaller, individual fields. This practice saves time, money, and the environment. So, how do they work? The crop sensor is mounted on the tractor which moves across the field. The sensor emits a burst of light onto the crop’s leaves and measures the amount of light reflected back. Dark green leaves reflect less light back than lighter ones. Lighter leaves indicate the plant needs nitrogen. Nitrogen is a major component of chlorophyll, the compound that gives plants their green color. The computer calculates the amount of nitrogen to apply to that part of the field as it goes along! Nutrient management requires knowledge of the soil, nutrients, the plant, and the environment. Once the right nutrient rate is determined (through soil testing), the grower must then consider how the nutrient will be applied, the timing of the application, the placement, and which product will provide the best solution to the nutrient needs.